"A "Locked" Card is turned face-down and cannot do anything. It is turned back face-up at the end of its owner's turn." 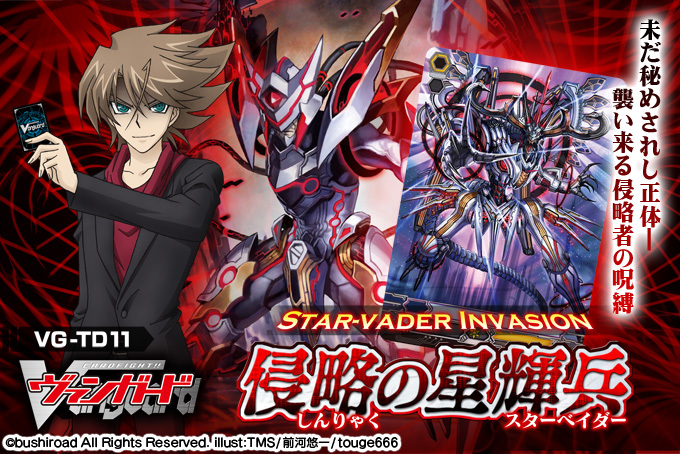 The official Japanese portal has updated with information on the long-awaited Link Joker clan, and the Lock mechanic that they will be introducing in TD11: Star-Vader Invasion and BT12: Binding Force of the Black Rings. This new mechanic extends both to Link Joker units and “Я” or Reverse series units, those corrupted by the clan. According to Doctor O's twitter, locked cards are rendered completely unusable, are no longer treated as rearguards, and so cannot be retired or have new units called over them. Furthermore, the clan of a Locked unit is negated in the process. Locked units effectively no longer exist but still prevent their rearguard circle from being used, creating a disruptive strategy that destroys rearguard-centric decks--and in a format that has in many ways been defined by the mass distribution of Masquerade and Kay clones, most decks of the current format will feel the effects of that. 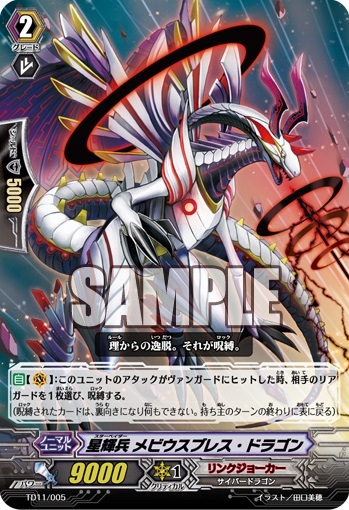 As the Lock lasts throughout the turn of the card's owner, “Я” units that use Lock to pay costs like Vowing Saber Dragon “Я” have an advantage over opponents inflicted with Lock by card skills, as they will regain the use of their rearguards at the end of the turn that they paid the cost in, while the opponent will have to sit through both the Lock user's turn and their next one until they get back control of their cards. The new Link Joker units unveiled are listed below, with translations provided by NeoArkadia. 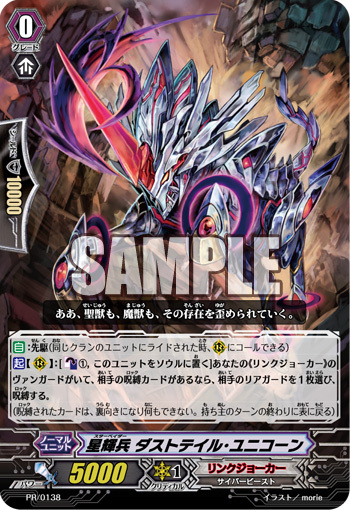 Activate (R): [Counter Blast 1 Card, Place this card in the Soul] If you have a "Link Joker" Vanguard and your opponent has a Locked Card, you can choose 1 of your opponent's Rearguards, Lock it. 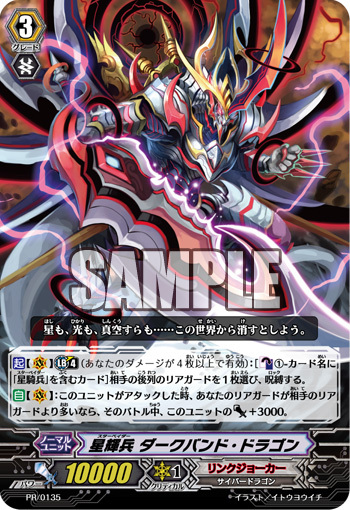 Activate (V) Limit Break 4: [Counter Blast 1 Card with "Starvader" in its name] Choose 1 of your opponent's Back Row Rearguards, Lock it. Auto (V): When this Unit attacks, if you have more Rearguards than your opponent, this Unit gains 3000 Power during this turn. 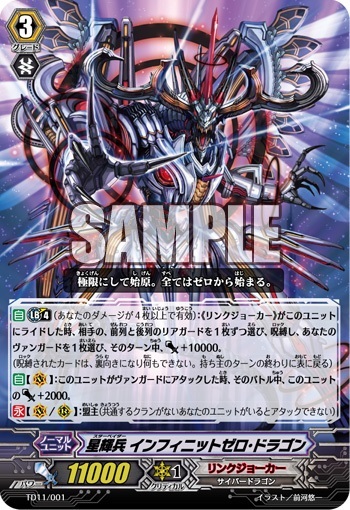 Auto Limit Break 4: When a <<Link Joker>> rides this Unit, your opponent chooses 1 Rearguard in their Back Row and Front Row, and Locks them, then you choose 1 of your Vanguards, this Unit gains 10000 Power during this turn. Auto (V): When this Unit attacks the Vanguard, it gains 2000 Power during this Battle. Auto (V): When this Unit's Attack hits the Vanguard, choose 1 of your opponent's Rearguards, and Lock it. Note that units returning from Lock are not entering a rearguard circle but are instead being flipped back over, so on-call skills like that of Gigantech Charger will not activate. Units which gain power from having other units on the field like Liberator of the Round Table Alfred and The Dark Dictator will not be able to derive any power from Locked units, as those units do not exist until they are turned back up.